This interview with Alberto Contador was conducted on June 17, the day before the Route du Sud, by Carlos Arribas of El País. It was the day, incidentally, of the 70th birthday of Eddy Merckx. He’s been the greatest in history. I’ve run into him a few times, and the class that he had as a rider he continues to have as a person. To say Merckx is to say cycling and to say history. Indurain is Spanish, and that’s why he puts so much into it, but Merckx has been the greatest of all. He’s a cut above Indurain and all the other cyclists. His palmares: five Tours, five Giros, a Vuelta… Is he a reference for you? I’ve never thought about records or a great number of victories. I take it one year at a time, considering different objectives and, clearly, each time I’m adding more victories. That’s what motivates me, but I never think about breaking the records for most wins. And what Eddy Merckx has done is incredible. If you were to win the next Tour, you’d be doing it eight years after winning your first – a test of longevity bested only by Giro Bartali, who won two, ten years apart. I really hope I can achieve that. The Giro just ended and a fan sent me a pile of photos of my grand tour podiums. I saw them and it made me think about the number of different rivals that have come and gone. All kinds: time-trialists like Evans, climbers like Andy Schleck, new people like Froome and young riders who are on their way up. That’s the march of three generations. And that makes me feel proud, consistently being a race favorite since 2007. Merckx said that the Giro is the best preparation for the Tour. Well, I don’t know what to say. Until two days ago, I couldn’t even start to get up out of bed without pain in my leg muscles, or in other words, fatigue. In the training camp at altitude after the Giro, every morning the masseur asked me how it was going, and I told him that the leg pain must be because he was using too much pressure in the massage, but he said that no, he wasn’t using too much pressure. Later, on the bicycle I’m doing fine. But the last few days, the pain has gone away. I seem to have changed bodies, and that motivates me. Psychologically I’m in great shape. I’ve had to say no to celebrations, to spending time with friends, to dining out, to drinking even one glass of wine in a month, to a thousand things. I’ve lived completely and utterly for the bike. It’s not exactly a pleasure to give up all those things, but when I made the decision to do the Giro-Tour double, I made the decision accepting all the consequences. Even though I know that it’s a big effort, I prepared myself psychologically – just as if I were training – for all the things that I was going to have to give up. Is everything turning out the way you thought it would when you started the adventure? Yes, even though in the Giro I did a huge effort with by means of massive concentration. There were three or four days in which I had to do a genuine time trial, apart from the time trial itself. Mortirolo, Verbania and on Finestre were days of maxium effort that made me exhausted when I got to the hotel. In the Dauphiné, Froome was seen to be isolated, without teammates, in one stage. Is the epoch in which just one team could control the race over? Yes and no. Astana had a good train in the Giro, although luckily it didn´t work out for them. Everything is relative. The Dauphiné stage was a complicated day and I don’t know what Sky was thinking. One thing is clear: you can’t focus on watts, reducing it to watts per kilo and how long you can maintain it on a climb. There are a lot of other factors: the weather, in every sense: rain, snow, sun, mist, cold… And then, the course and the race situation: A time trial could take its toll on the following day; the day after a rest day it might be hard for some people to re-start… You have to put everything on the balance, arrive in optimal performance condiition, and choose among whatever tactical possibilites are under consideration. Do you have to ride with the audacity of someone who thinks that a risk always pays off? There are times at key moments in which you have to make quick decisions, and you might hit the nail on the head, or not. And I like to try to create situations that can benefit me, often improvised. Personally, trying something different from what’s established, from what’s expected, from what’s normal, motivates me. But I don’t forget that you always have to think with your head and analyze things so that what you’re going to do makes sense. Senseless attacks are worthless because this is a sport in which winning matters. But, yes, sometimes it’s the way you win that’s important, too, with moves that people remember. The favorite? Contador? Quintana? Nibali? Froome? There are several of us, yes, and three of use know what it is to win the Tour. Quintana doesn’t know it yet, but he’s a young rider who was able to finish second two years ago, and he has prepared meticulously. The four of us are at similar level, but by virtue of the experiences I’ve had with him during my career, the one I’d highlight a little above the others, even though there’s no long time trial, is Froome. Will you continue your custom of trying to put on the yellow jersey on the first day in the mountains? That’s not something that I’m thinking about. What I think about more is taking advantage of opportunities. Say you have a good day, and there’s a good route, then you have an opportunity to take time on your rivals. If, on the first summit finish (Stage 10, Pierre-Saint Martin) you have good legs, you have to take advantage of it, obviously. Maybe you don’t distance everybody, maybe you don’t distance anybody, but maybe you distance one person, and already you’ve made progress. It will be complicated, and especially for me, coming from the stress of three weeks in the Giro, and I’ll have to tackle a really tense fight, team against team, narrow roads, wind, the northern rain, cobblestones… It will be hard psychologically more than anything else. And it will be like the Giro, ridden without respite. Cycling nowadays is more hotly disputed that it used to be. Every stage is fought as if it were the last one, either in a sprint, in a breakaway… Each rider is looking for his own opportunities and the ones that ride to win the GC always have to sprint to be among the first 20, whereas before we were able to ride farther back. Now, if you arrive 50 places down you could lose time, and that involves a risk. Maybe it’s the pressure or the tension of the teams who are being directed from the car, but it makes it so that each stage is ridden without respite, in spite of how it might seem on TV. In the Giro, particularly, you gave the impression that you might be able to manage perfectly well without a team director, as if you could make all the decisions and orchestrate the tactics. Is the role of the director less important? In my case – except in specific moments influenced by how my legs feel, where, it’s true, I’m the one that makes the decisions – they play an important role in flatter stages. He warns you about dangers, about narrowings in the road, about wind… They’re important there. What did you learn from 2011, the other year that you tried for the Giro-Tour double? Even though it might seem like a fib, because I didn’t win, the 2011 Tour is one that gives me confidence. It’s a race that was cursed for me from the very beginning. On the first day, I lost 1:20 in a crash, and I gutted myself in the final 10 kilometers; in the team time trial we left first and lost 40 seconds to Schleck and Evans, my direct rivals. Losing two minutes in two days is not the most desireable thing. And before the Pyrenees I crashed again and hurt my right knee, and was on the verge of going home. I stayed for personal reasons. I got through the Pyrenees as best I could and focused on the Alps. I survived, but I crashed again. In the Alps I had a bad day on the Galibier, where I cracked three kilometers from the end, but on the next day I had good legs and did something that I’ll always remember, something that I feel more proud of than attacking five kilometers from Alpe d’Huez and winning the stage. I attacked from the beginning and in the end, people who love cycling enjoyed it, and I’m glad. And in the final time trial I was beaten by only two riders, Tony Martin and Cadel Evans… Doing a comprehensive review, without the bad day on the Galibier, in spite of all the crashes and all that, I would´ve fought to the finish for the win. And that gives me confidence. What do you want to prove with the double? It’s a personal challenge. A big dream. The Tour is the most important race, the race that changes your life, and I can vouch for that. Until you win you don’t realize its impact and repercussions, but, on the other hand, in my career as an athlete, one Tour more or less is not going to make it more memorable. On the other hand, if I won the Giro-Tour double, it would be something that everyone would remember in the history of the sport. In life, you have to live for incentives and challenges, and for me this is a really big one. There are people who think that it’s impossible. I think that the first thing you have to do is to try. It will be really hard. I’m doing absolutely everything in order to recover, every hour, every minute, every day, everything last thing in order to be the best I can possibly be in the Tour. Then we´ll see if it can be done or not, because it’s not only a physical challenge, but, above all, a mental one. And then the race has to go well… But, the people who bluntly dismiss it as impossible motivate me even more. Contador visited the governmental headquarters of the Community of Madrid for a celebration of his latest grand tour win, which he took in Milan on Sunday and described as ¨the fruit of a lot of work, sacrifice and facing a large amount of difficult situations.” The cyclist, who was received by regional president Ignacio González, expressed his thanks for the reception and assured his hosts that it was “very special, in spite of it not being the first or second time” that he has come back with a new title. “This year is going to be really taxing for me both on the physical and mental levels because I have one month of recovery time between the Giro and the Tour. It’s complicated to arrive there with guarantees, but this is the challenge that I’ve set. We’ll see what can be done in the end,” Contador said about his next goal, the Tour de France. 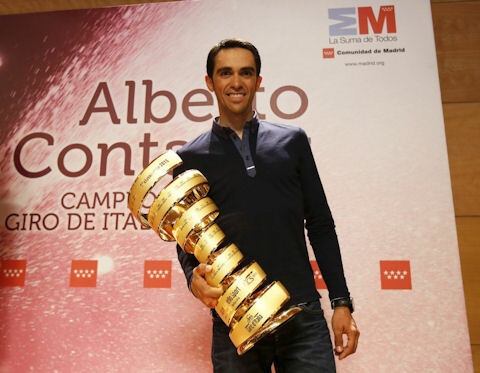 Contador, a native Madrilenian from Pinto, brought along a maglia rosa – the jersey worn by the leader of the Giro d’Italia – and after signing the guest book in the Real Casa de Correos in the Puerta del Sol, he gave it to President González, who said, “Once again, this year he’s made us suffer, with that crash, that shoulder dislocation, that climb of the Mortirolo, which seemed that it would never end. And once more, he did it all with that class, that strength of will, that conviction, and that faith that with work and effort he can do anything,” said González. Contador posed for photos with dignitaries before setting out for Pinto and a hometown tribute. *González' future is a matter still to be decided after May elections.